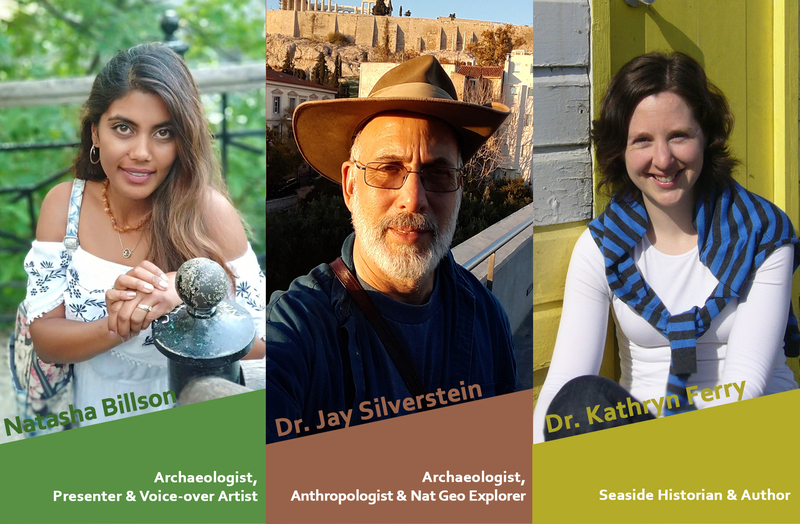 Past Preservers is thrilled to announce the latest addition to our team of presenters: Dr Jay Silverstein, Natasha Billson & Dr Kathryn Ferry, who bring a wonderful mix of Egypt, the seaside & muddy fields to our presenter lineup! Find out more…. Natasha is a Field Archaeologist, with working knowledge of British archaeology, London’s history and archival techniques. She enjoys public speaking, interacting with people of all ages and cultures. When Natasha is not rescuing archaeology, you will find her vlogging about historical/archaeological sites around the world and in particular Ukraine; where she is actively showcasing its culture and hidden treasures. Natasha is a frequent traveller to Kyiv, where she is a Voice-Over Artist and Presenter for the segment ‘Archaeology Time’ on Allatra TV. Jay is one of the most diverse archaeological scholars in the world. From the dawn of civilisation to the wars of the 20th century, Dr. Silverstein has sought answers in remote and often dangerous places as he strives to explain how war,technology, and religion shaped the fate of people. His work challenges assumptions of how people survived and why they died. His passion to solve mysteries has taken him from the Mountains of North Korea to the Highlands of Papua New Guinea to the forest of Guatemala to Mexico’s Tierra Caliente and to the Nile Delta of Egypt. From these far corners of the world he searches for answers to how humanity adapted to environmental challenges and political stressors and,ultimately, how and why civilizations rose only to fall into ruin. Kathryn is a historian who loves to be beside the seaside. She studied at Cambridge University for a PhD in Victorian architectural history and, since falling in love with beach huts, has become a leading expert on the buildings and traditions of the Great British seaside holiday. As well as books on this subject she has published on Victorian homes, 1950s kitchens and the little-known history of bungalows. Following her book on holiday camps she was commissioned to write the official history of Butlin’s. She is a well respected lecturer and frequently contributes to television and radio programmes.